I took this image on Tuesday night this week. (Click for a bigger version.) Sky conditions were very good. 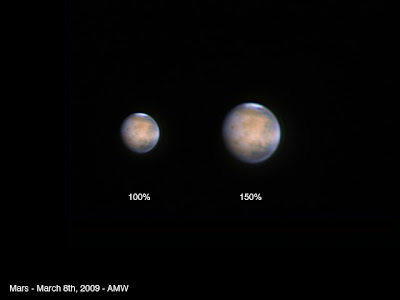 Mars is pretty small currently, but I managed to capture lots of detail on the small disk. The dark dot poking through the light clouds on the left is Olympus Mons, the solar system's largest volcano.